If there’s a little girl in your life or you just want to express your inner child, this darling bow will add a touch of girlish innocence to any outfit. It’s quick, easy and fun to make, and in no time, you can have one in every color. It also works as a pretty little introduction to post stitches and how they can be used to add texture to your work. 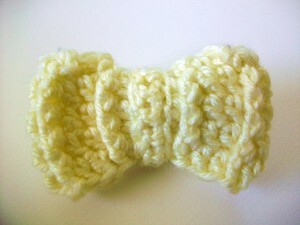 This bow can be worn on a clip or an elastic to control your hair with style. Wrap the middle piece around the main body, preferably between two ridges. Sew the ends of the middle piece together and weave in ends. Sew or glue the bow to a hair clip or hair elastic. Alternatively, you can slip certain styles of hair clip through the back of the middle piece without gluing or sewing and have an interchangeable accessory. This entry was posted on Saturday, August 27th, 2011 at 9:56 AM by Candace	and is filed under Free Crochet Patterns. You can follow any responses to this entry through the RSS 2.0 feed. You can leave a response, or trackback from your own site. It would be great on a hairband! Very nice pattern. Thanks for sharing! “Round 2-5” — So do I repeat the instructions after this until I reach the 5th step? Or do I go back to Round 2 & then 2-5 over & over again until finished? That’s a typo. It should say rounds 3-5, so repeat those instructions until you have 5 rounds done. I made one of these to put in my hair and it turned out much bigger than I expected (I should learn to read the “finished size” before I start something…). I didn’t really know what to do until I remembered somebody crochets with embroidery floss. It worked perfectly with my one steel hook (size 6). I left off the last row of the bow because I didn’t have enough floss (or I didn’t think I had enough). The finished object turned out about an inch and a half wide, which is almost exactly what I was looking for. I used almost an entire tiny skein of embroidery thread, too! Thanks for the pattern. I’m going to use up my far-too-big bag of embroidery thread on these!